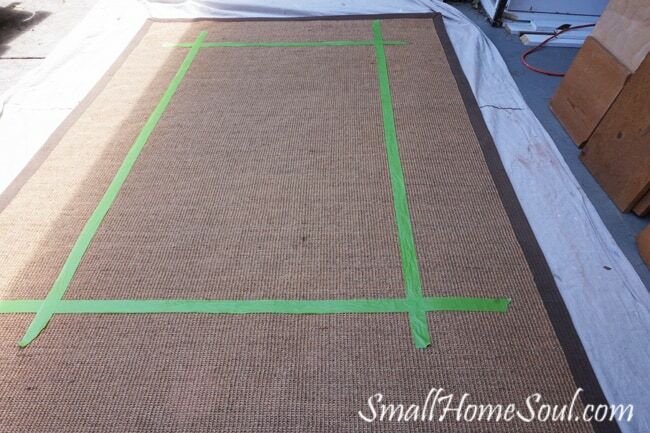 Painted Seagrass Rug - My Patio Refresh Part 1 - Girl, Just DIY! 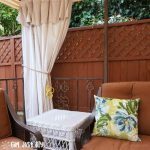 Hi Friends, I’m working on a few refresh projects for my patio to brighten it up a bit and I’m happy to share them with you. 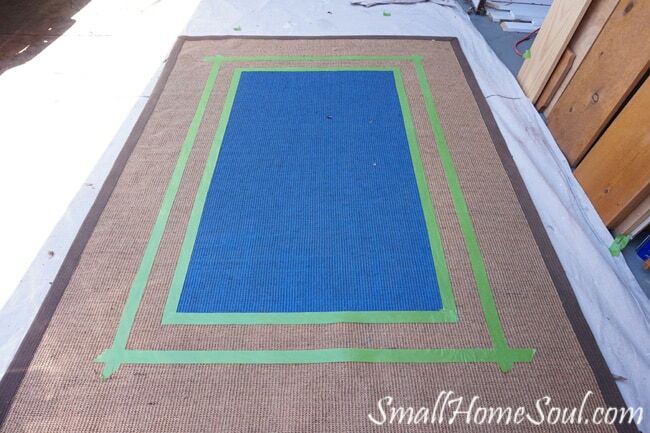 Part 1 of my refresh is a painted seagrass rug. I got the original idea from a blog I read years ago where the woman painted their initial on her rug. 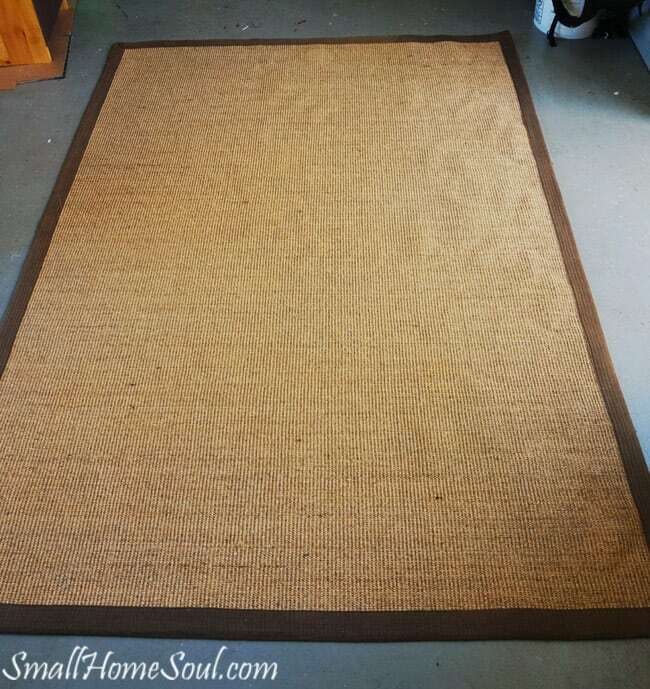 I had bought a seagrass rug for our entryway and wanted to do the same thing but the years got away from me and finally the rug was rolled up and sat in our shed for a few more years. This is our patio before. It looks nice enough; the arbor gives us shade, our furniture is attractive and comfy, and the pillows I got from Lowe’s last summer still look great. But overall the patio is boring. 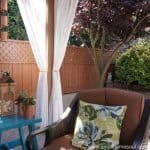 The fence behind our arbor blends in with the furniture cushions. But that’s all about to change, thankfully. Since we’re currently a one-income family I need to use as much of our own stuff as possible to save money. Well, I like to save money all the time by doing my own projects, but you get the idea. So I went to the shed and pulled out the rug and unrolled in on the garage floor to flatten while I pondered design options. My husband had suggested using it on the patio before but I thought it was too boring. It won’t be boring for long. I busted out the Frog Tape and was going to add stripes and even got a few down. But seriously, the border section was off just enough that no matter where I measured I got a different number. Talk about headaches and OCD at its finest. I have a hard time just eyeballing stuff and going with it. If I could loosen up on such small details I think my life would be easier 🙂 But it didn’t feel right so I moved on to another project for a bit. Then one day I thought I should just create a rectangle in the middle where the coffee table would sit. I pulled the seagrass rug out onto the driveway and onto the doubled-up drop cloth. Depending on the backing you might be able to get away without one but I wasn’t willing to risk it. To deal with those swerving edges I laid out a long board and got it as close to square as I could and used that as the guide to apply the Frog Tape. 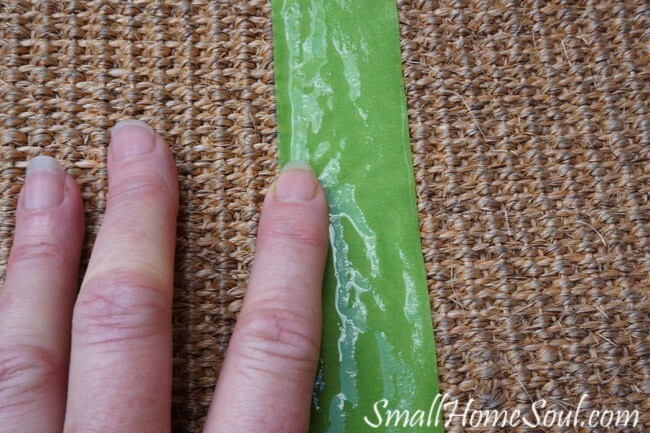 Frog Tape is so awesome because it has a moisture activated edge to help create a better seal. Before I started painting with the chip brush I decided to spray the edges with a little water and then I rubbed my fingers along the edge to press it down. I’m not sure if this was necessary but I really didn’t want the paint wicking into the fibers under the tape. I created a short video that I included below. It’s easier for you to watch how I applied the paint than for me to try and explain it here. I’m a visual learner which is why I love watching video demos. It’s my first of what I hope are many more to come. 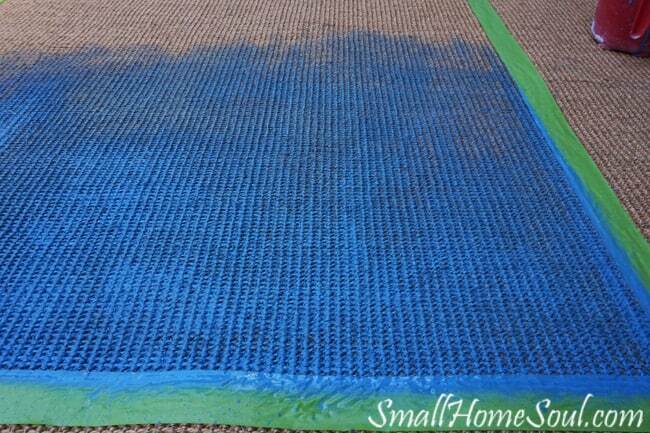 You can also see the consistency of the paint I used; it needs to be really watery so it can absorb into the fibers of the rug. If it’s too thick it will just sit on the surface and it will be hard to distribute. Thanks to Frog Tape and how I applied the paint the edges were nice and crisp. The next day after it was fully dry I decided to add a bit more color and interest with a border pulling another color from the pillows. You can learn more about the border paint in the video below. There were a few places where the border bled onto the blue. It was just a tiny bit and I was able to touch up with the blue paint and the tip of a foam brush. Make sure you keep that watery paint in a mason jar until you know you’re all done. Especially if it’s a custom color mix like mine was. Not that I went and had it custom mixed, I combined two colors I already had until I was happy with the shade. Oh, and in the blue square I think I used about 3 cups of watery paint. Your project might require more or less. Ok, I know you’re so excited to see my very first video. Not perfect but not bad for a total novice. I hope the video has given you the courage to try painting your own seagrass rug. The smaller yet similar rug on my front porch that was looking a little tired; see how I gave it a little refresh. Please leave me a comment and let me know what you think and if you’ve ever tried painting a rug. If you like this post you might also like my planting a succulent garden post. Don’t you love how quick and easy paint transformations are! This is a great one! I love the bright colors! 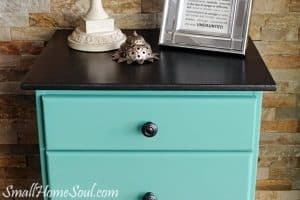 Thank you for linking up with us at Talk DIY to Me Toni! I hope you enjoy the party and come back next week! This rug totally took your patio from blah to beautiful!! Such a great tutorial too. I wish I had a rug to paint now! I will have to be on the look out now. Love the pops of color from the pillows! 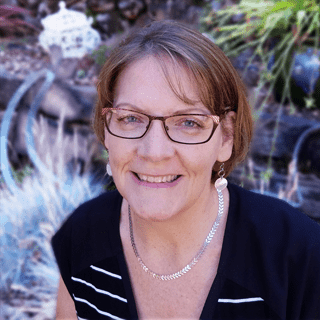 Thanks for the inspiration Toni! Heather, it’s like night and day out there now. Let me know if you find one and send me some pics of yours. It’s a fun project and makes a huge change. I need a rug to paint!! I love it! You are so talented! I am so glad to have met you on FB and to be working with you. I’m learning so much from you! I love your blog!!! Kellie, you are so sweet, thank you so much. I love your home, your style is so inviting and lovely! 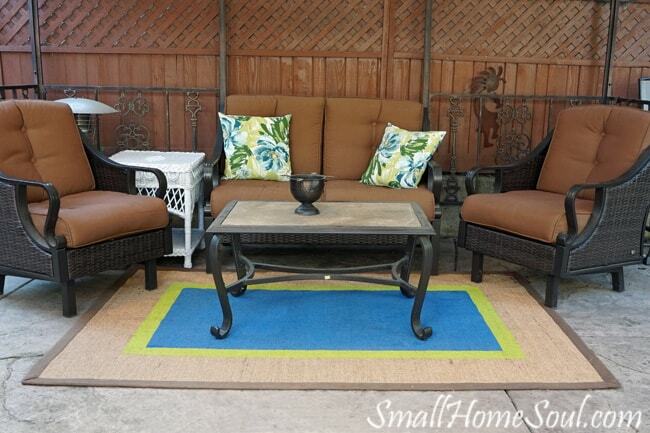 What a great pop of color on your patio! I wouldn’t have even known this was possible to do. That’s a pretty cool idea to customize a rug! Hi Melony, thank you for visiting! Yes, it definitely brightens up the space. 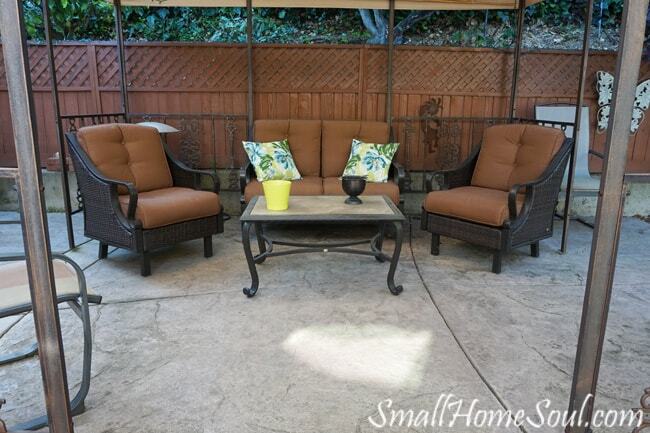 The color combination might not work for everyone but it is just want that brown patio needed . It was a fun project, you should give it a try sometime. Rugs add life and color to large spaces and tie a big space into something a bit more cozy. Your rug is gorgeous! 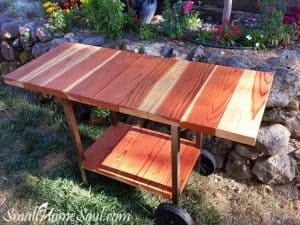 I love simple DIY projects because I think I have a short attention span when it comes to a lot of details in making something I could buy. But making it yours allows you to have colors that complement your ideas instead of what the current market has available. The rug turned out great! The colors go perfectly with your pillows. Thanks Sheila, I have another color coming into the mix in one of the next few installments of this little series. It’s starting to look like a “room” instead of a bunch of stuff sitting together. Maria, you can do it!! Dear Sweet Susie, if I lived closer I would so be there! And thank you, a painting compliment from you means a lot!